Walter Benjamin emerged from the head-on collision of an idealistic youth movement and the First World War, which Benjamin and his close friends thought immoral. He walked away from the wreck scarred yet determined “to be considered as the principal critic of German literature.” But the scene, as he found it, was dominated by “talented fakes,” so—to use his words—“only a terrorist campaign would I suffice” to effect radical change. 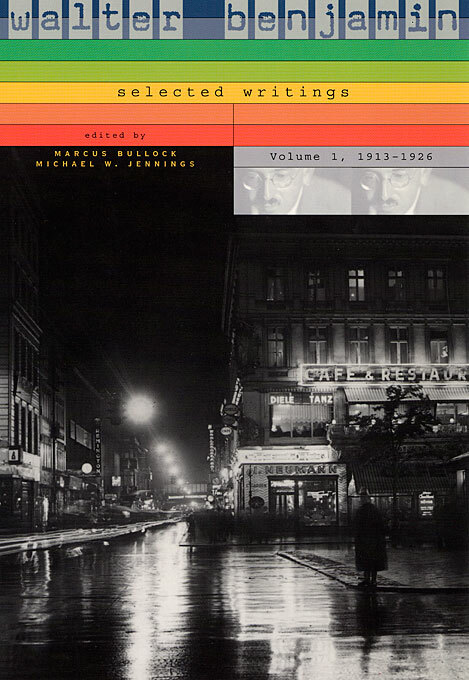 This book offers the record of the first phase of that campaign, culminating with “One Way Street,” one of the most significant products of the German avant-garde of the Twenties. Against conformism, homogeneity, and gentrification of all life into a new world order, Benjamin made the word his sword. Volume I of the Selected Writings brings together essays long and short, academic treatises, reviews, fragments, and privately circulated pronouncements. Fully five-sixths of this material has never before been translated into English. The contents begin in 1913, when Benjamin, as an undergraduate in imperial Germany, was president of a radical youth group, and take us through 1926, when he had already begun, with his explorations of the world of mass culture, to emerge as a critical voice in Weimar Germany’s most influential journals. The volume includes a number of his most important works, including “Two Poems by Friedrich Hölderlin,” “Goethe’s Elective Affinities,” “The Concept of Criticism in German Romanticism,” “The Task of the Translator,” and “One Way Street.” He is as compelling and insightful when musing on riddles or children’s books as he is when dealing with weightier issues such as the philosophy of language, symbolic logic, or epistemology. We meet Benjamin the youthful idealist, the sober moralist, the political theorist, the experimentalist, the translator, and, above all, the virtual king of criticism, with his magisterial exposition of the basic problems of aesthetics. Benjamin’s sentences provoke us to return to them again and again, luring us as though with the promise of some final revelation that is always being postponed. He is by turns fierce and tender, melancholy and ebullient; he is at once classically rooted, even archaic, in his explorations of the human psyche and the world of things, and strikingly progressive in his attitude toward society and what he likes to call the organs of the collective (its architectures, fashions, signboards). Throughout, he displays a far-sighted urgency, judging the present on the basis of possible futures. And he is gifted with a keen sense of humor. Mysterious though he may sometimes be (his Latvian love, Asia Lacis, once described him as a visitor from another planet), Benjamin remains perhaps the most consistently surprising and challenging of critical writers.